Ephedra has been used in traditional Chinese medicine (known as Ma Huang) for centuries as a stimulant and antiasthmatic agent, and was recently introduced into use in the United States and Europe as a weight loss agent and aid in body building. Ephedra has been linked to multiple potentially severe side effects including clinically apparent liver injury and has been banned from sale in the United States and elsewhere. Ephedra is prepared from the aerial parts of plants belonging to the genus Ephedra, family Ephedraceae. The 45 species of Ephedra are found worldwide, but Ephedra sinica is used predominantly and is native to China where it was first used therapeutically. Ephedra is an herbaceous perennial with a strong pine odor and astringent taste which accounts for its Chinese name – Ma Huang – which can be translated as “yellow astringent” or “yellow hemp.” Ephedra is purported to increase mental acuity and to improve sexual performance, increase circulation, and decrease weight through an increase in sympathetic nervous system activity and thermogenesis. It is also used for allergies, allergic rhinitis, colds, flu, fever, chills, nasal congestion, bronchospasm and asthma. The active ingredient of ephedra appears to be ephedrine and other related sympathomimetic alkaloids, which probably account for its therapeutic efficacy as well as its adverse effects. Ephedra was a component of many herbal weight loss and body-building preparations, including Ma Huang, Herbalife, Hydroxycut and others. The typical dose is 1.5 to 9 grams of the decocted herb daily or as herbal tea prepared by boiling dried green stems in water. Side effects are not uncommon and include nervousness, anxiety, palpitations, tachycardia, gastrointestinal upset, nausea, diarrhea, headache, and dizziness. Ephedra has also been implicated in an increased risk for myocardial infarction, stroke and sudden death and was banned from sale in the United States in April 2004. Despite its apparent safe use for centuries in Chinese traditional medicine, ephedra has been linked to many serious and potential fatal side effects since its wide-scale use in Western countries for weight loss. The major reported serious adverse events were cardiovascular, including hypertension, palpitations, myocardial infarction, seizures, transient ischemic attacks, cerebrovascular accidents and sudden death. Ephedra preparations have also been implicated in more than a dozen instances of clinically apparent, acute liver injury. The time to onset has ranged from a few weeks to more than 6 months, but averages 12 weeks, presenting with symptoms of fatigue, nausea and abdominal discomfort followed by jaundice. The serum enzyme elevations are typically hepatocellular and the clinical syndrome resembles acute viral hepatitis. Immunoallergic features (rash, fever and eosinophilia) are uncommon as are autoantibodies. Recovery occurs within 1 to 6 months of stopping the ephedra preparation, but instances with acute liver failure and death or need for emergency liver transplantation have been reported. Ephedra extracts contain multiple compounds including the sympathomimetic alkaloids ephedrine, pseudoephedrine, methylephedrine and norephedrine. The cardiovascular side effects and complications of ephedra use have been attributed to these sympathomimetic constituents. The liver injury has been attributed to ephedrine as well, but other constituents may be responsible for this idiosyncratic liver injury. The severity of liver injury due to ephedra ranges from mild, asymptomatic elevations in serum enzymes to clinically apparent acute liver injury and to acute liver failure. Chronic use of ephedra has been linked to a chronic hepatitis-like syndrome, but recovery is prompt when ephedra is stopped. There have been no instances of vanishing bile duct syndrome attributed to ephedra. Recurrence of liver injury is typical when ephedra is restarted, and rechallenge should be avoided. There is no apparent cross sensitivity to liver injury between ephedra and other weight loss agents or herbal preparations, but ephedra was previously found in many commercial herbal preparations. Other names: Ma Huang, belcho, Chinese ephedra, desert herb, ephedrine, heral ecstasy, Joint fir, Mongolian ephedra, Pakistani ephedra, popotillo, sea Grade, Teamster’s tea, yellow astringent, yellow horse. Case 1. Acute hepatitis due to Ma Huang. A 33 year old woman developed nausea and abdominal discomfort a few days after starting Ma Huang for weight loss. She continued taking the product for another 3 weeks when she noted jaundice and sought medical attention. She had no history of liver disease, alcohol abuse or risk factors for viral hepatitis and liver tests were known to be normal two years earlier. She was taking no other medications. Initially, she did not reveal that she was taking an herbal product. On examination, she was jaundiced and had hepatic tenderness but no fever, rash or signs of chronic liver disease. Laboratory tests showed raised serum bilirubin (4.5 mg/dL) and prominent elevations in serum aminotransferase levels (ALT 832 U/L, AST 376 U/L), with minimal increase in alkaline phosphatase (178 U/L). Tests for hepatitis A, B and C and a monospot were negative. Autoantibodies were present in moderate titers with ANA 1:160 and SMA 1:80. Ultrasound and computerized tomography of the liver were normal. She was initially thought to have viral hepatitis and sent home. She restarted Ma Huang but quickly felt worse, stopped and returned to the hospital where liver tests were found to be worse (Table). A liver biopsy showed changes of acute hepatitis with occasional eosinophils and plasma cells suggestive of drug-induced liver disease. She stopped taking Ma Huang and when seen four months later, all liver tests were again normal. A typical case of an acute hepatitis due to Ma Huang. The time to onset was difficult to assess, because she reported having nausea and abdominal discomfort “soon after” starting Ma Huang, but the time to jaundice was about 4 weeks. The clinical presentation was similar to acute viral hepatitis, which was the initial diagnosis, because the patient did not admit to using an herbal product (and this was the first report of Ma Huang related acute liver injury). The finding of autoantibodies might suggest an autoimmune drug-induced hepatitis. Immunoglobulin levels and serial ANA titers were not provided, but the liver histology did not suggest autoimmune hepatitis. Moderate levels of autoantibodies are not infrequent in cases of acute liver injury due to Ma Huang, but autoimmune features (hyperglobulinemia, prolonged course, response to corticosteroids) are not found. Zimmerman HJ. Unconventional drugs. Miscellaneous drugs and diagnostic chemicals. In, Zimmerman, HJ. Hepatotoxicity: the adverse effects of drugs and other chemicals on the liver. 2nd ed. Philadelphia: Lippincott,1999: pp. 731-4. (Expert review of hepatotoxicity published in 1999; Chinese herbals are discussed but not Ma Huang or ephedra specifically). Liu LU, Schiano TD. Hepatotoxicity of herbal medicines, vitamins and natural hepatotoxins. In, Kaplowitz N, DeLeve LD, eds. Drug-induced liver disease. 2nd ed. New York: Informa Healthcare USA, 2007, pp. 733-54. (Review of hepatotoxicity of herbal and dietary supplements [HDS] published in 2007; Ma Huang has been linked to numerous instances of acute, clinically apparent liver injury presenting with an acute hepatitis, often with fever, resolving rapidly on stopping). No authors listed. Ma huang: ephedra sinica. In, PDR for Herbal Medicines. 4th ed. Montvale, New Jersey: Thomson Healthcare Inc. 2007, pp 543-52. (Compilation of short monographs on herbal medications and dietary supplements). Dulloo AG, Stock MJ. Ephedrine in the treatment of obesity. Int J Obesity 1993; 17(suppl 1): S1-2. PubMed Citation (Ephedrine is a sympathomimetic alkaloid found in several species of ephedra, which acts as a thermogenic agent increasing the metabolic rate; the safety of this approach to obesity has not been fully established). Nadir A, Agrawal S, King PD, Marshall JB. Acute hepatitis associated with the use of a Chinese herbal product, ma-huang. Am J Gastroenterol 1996; 91: 1436-8. PubMed Citation (33 year old woman developed nausea within days of starting Ma Huang for weight loss, followed at 3 weeks by jaundice [bilirubin 4.5 rising to 8 mg/dL, ALT 832 U/L, Alk P 178 U/L, ANA 1:160, asterixis], resolving within 4 weeks of stopping: Case 1). Haller CA, Benowitz NL. Adverse cardiovascular and central nervous system events associated with dietary supplements containing Ephedra alkaloids. N Engl J Med 2000; 343: 1833-8. PubMed Citation (Systematic review of 140 reports of adverse events due to ephedra products submitted to the FDA over a 2 year period; including hypertension, palpitations, arrhythmias, myocardial infarction, seizures and stroke, 10 were fatal and 13 led to disability; no mention of hepatotoxicity). Borum ML. Fulminant exacerbation of autoimmune hepatitis after the use of Ma Huang. Am J Gastroenterol 2001; 96: 1654-5. PubMed Citation (58 year old woman developed jaundice 4 months after starting Ma Huang for weight loss [bilirubin 9.3 mg/dL, ALT 293 U/L, Alk P 320 mg/dL, protime 21.1 sec, SMA 1:320, ANA negative], developed ascites and was referred for transplant, but resolved spontaneously after stopping herbal). De Smet PAGM. Herbal remedies. N Engl J Med 2002; 347: 2046-56. PubMed Citation (Review of status and difficulties of herbal medications, including lack of standardization, federal regulation, contamination, safety, hepatotoxicity and drug-herb interactions; specific discussion of 4 herbs with therapeutic promise: ginkgo, hawthorn, saw palmetto and St. John’s wort). Schiano TD. Hepatotoxicity and complementary and alternative medicines. Clin Liver Dis 2003; 7: 453-73. PubMed Citation (Comprehensive review of herbal associated hepatotoxicity; mentions a single case of severe hepatitis attributed to Ma Huang [Nadir, 1996]). Bajaj J, Knox JF, Komorowski R, Saeian K. The irony of herbal hepatitis: Ma-Huang-induced hepatotoxicity associated with compound heterozygosity for hereditary hemochromatosis. Dig Dis Sci 2003; 48: 1925-8. PubMed Citation (44 year old man developed jaundice 4 months after starting Hydroxycut with Ma Huang [bilirubin 3.5 mg/dL, ALT 3600 U/L], resolving within 1 month of stopping; HFE testing revealed compound heterozygosity: C282Y/H63D). Pittler MH, Ernest E. Systematic review: hepatotoxic events associated with herbal medicinal products. Aliment Pharmacol Ther 2003; 18: 451-71. PubMed Citation (Systematic review of published cases of hepatotoxicity due to herbal medications, listing 52 case reports or case series, most common agents being celandine , chaparral , germander , Jin Bu Huan , kava , Ma Huang , pennyroyal , skullcap , Chinese herbs  and valerian ). Abourashed EA, El-Alfy AT, Khan IA, Walker L. Ephedra in perspective – a current review. Phytother Res 2003; 17: 703-12. PubMed Citation (Review of history, botany, chemistry, pharmacology, clinical efficacy and safety of ephedra; by the year 2000, the FDA had received 1000 injury reports, often attributed to misuse, abuse or mislabeling of the product; only one report of hepatitis). Russo MW, Galanko JA, Shrestha R, Fried MW, Watkins P. Liver transplantation for acute liver failure from drug-induced liver injury in the United States. Liver Transpl 2004; 10: 1018-23. PubMed Citation (Among ~50,000 liver transplants reported to UNOS between 1990 and 2002, 270 [0.5%] were done for drug-induced acute liver failure, including 7 [5%] for herbal medications, one due to chaparral and one to kava; Ma Huang and ephedra not mentioned). Nelson R. FDA issues alert on Ephedra supplements in the U.S.A. Lancet 2004; 363: 135. 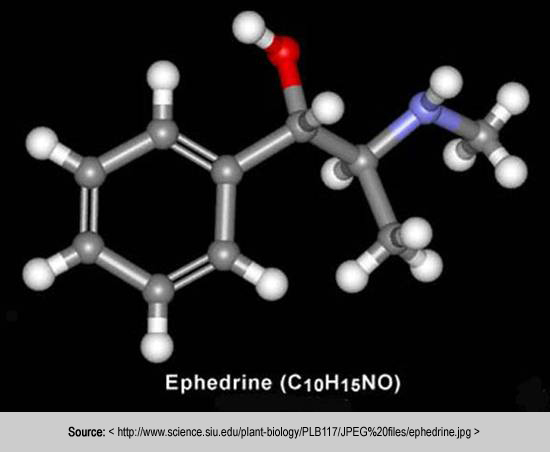 PubMed Citation (Report on FDA ruling that ephedrine alkaloids present an unreasonable risk of injury, after review of ~155 deaths blamed on ephedra). Neff GW, Reddy R, Durazo FA, Meyer D, Marrero R, Kaplowitz N. Severe hepatotoxicity associated with the use of weight loss diet supplements containing Ma Huang or usnic acid. J Hepatol 2004; 41: 162-4. PubMed Citation (Review of 12 patients with hepatotoxicity due to herbal weight loss agents, 10 due to Ma Huang [ephedra] with onset within 6 months in all but one [bilirubin 9.9-45 mg/dL, ALT 664-10,265 U/L], 1 died and 2 underwent liver transplantation, remaining recovered within 4-8 weeks). Skoulidis F, Alexander GJM, Davies SE. Ma huang associated acute liver failure requiring liver transplantation. Eur J Gastroenterol Hepatol 2005; 17: 581-4. PubMed Citation (57 year old woman developed nausea soon after starting Ma Huang and jaundice one week later [bilirubin 24.9 mg/dL, ALT 1061 U/L, Alk P 196 U/L], with progressive liver failure and transplantation, the explant showing massive collapse). Clark BM, Schofield RS. Dilated cardiomyopathy and acute liver injury associated with combined use of ephedra, gamma-hydroxybutyrate, and anabolic steroids. Pharmacotherapy 2005; 25: 756-61. PubMed Citation (40 year old man developed congestive heart failure and jaundice several months after starting anabolic steroids, ephedra and γ-hydroxybutyrate [bilirubin 3.9 mg/dL, ALT 2173 U/L, Alk P normal, INR 1.9], with slow recovery over next 18 months). Elinav E, Pinsker G, Safadi R, Pappo O, Bromberg M, Anis E, Keinan-Boker L, et al. Association between consumption of Herbalife nutritional supplements and acute hepatotoxicity. J Hepatol 2007; 47: 514-20. PubMed Citation (12 cases of liver injury attributed to Herbalife products in Israel, 11 women, 1 man, ages 32 to 78 years, onset after 2 to 35 months [mean peak bilirubin 9.1 mg/dL, ALT 1481 U/L, Alk P 282 U/L, 1 with ANA], on stopping, 11 recovered and one died of hepatitis B reactivation; 3 had a positive rechallenge). Stickel F. Slimming at all costs: Herbalife-induced liver injury. J Hepatol 2007; 47: 444-6. PubMed Citation (Editorial in reference to Schoepfer  and Elinay  discussing the difficulties in assigning causality and identifying the toxic component in herbal mixtures, many patients take multiple products and each includes multiple components). Chao S, Anders M, Turbay M, Olaiz E, Mc Cormack L, Mastai R. [Toxic hepatitis by consumption Herbalife products: a case report]. Acta Gastroenterol Latinoam 2008; 38: 274-7. Spanish. PubMed Citation (63 year old woman developed jaundice and pruritus 2.5 months after starting Herbalife products [peak bilirubin 17.5 mg/dL, ALT 847 U/L, Alk P 3 times ULN], resolving within 5 months of stopping). Chitturi S, Farrell GC. Hepatotoxic slimming aids and other herbal hepatotoxins. J Gastroenterol Hepatol 2008; 23: 366-73. PubMed Citation (Review of hepatotoxicity of herbal medications focusing upon those used for weight loss including nitrosofenfluramine, usnic acid, ephedra, germander, skullcap and green tea). Dara L, Hewett J, Lim JK. Hydroxycut hepatotoxicity: a case series and review of liver toxicity from herbal weight loss supplements. World J Gastroenterol 2008; 14: 6999-7004. PubMed Citation (Two women ages 33 and 40 years with onset of symptoms 1 and 4 weeks after starting Hydroxycut [bilirubin 0.7 and 20.9 mg/dL, ALT 1150 and 934 U/L, Alk P 299 and 112 U/L], resolving rapidly, ingredients including green tea but not ephedra; review of liver injury due to weight loss supplements including Ma Huang, Lipokinetix, Kava, green tea, Shou Wu Pian, germander and usnic acid). García-Cortés M, Borraz Y, Lucena MI, Peláez G, Salmerón J, Diago M, Martínez-Sierra MC, et al. [Liver injury induced by “natural remedies”: an analysis of cases submitted to the Spanish Liver Toxicity Registry]. Rev Esp Enferm Dig 2008; 100: 688-95. Spanish. PubMed Citation (Among 521 cases of drug-induced liver injury submitted to Spanish registry, 13 [2%] were due to herbals but none were attributed to ephedra or Ma Huang). Chalasani N, Fontana RJ, Bonkovsky HL, Watkins PB, Davern T, Serrano J, Yang H, Rochon J; Drug Induced Liver Injury Network(DILIN). Causes, clinical features, and outcomes from a prospective study of drug-induced liver injury in the United States. Gastroenterology 2008; 135: 1924-34. PubMed Citation (Among 300 cases of drug-induced liver disease in the US collected between 2004 and 2008, 9% of cases were attributed to herbal medications). Navarro VJ. Herbal and dietary supplement hepatotoxicity. Semin Liver Dis 2009; 29: 373-82. PubMed Citation (Overview of the regulatory environment, clinical patterns, and future directions in research with HDS; specific discussion of Herbalife and traditional Chinese herbal medicines). Fong TL, Klontz KC, Canas-Coto A, Casper SJ, Durazo FA, Davern TJ 2nd, Hayashi P, et al. Hepatotoxicity due to hydroxycut: a case series. Am J Gastroenterol 2010; 105: 1561-6. PubMed Citation (Details of 17 US cases of hepatotoxicity due to Hydroxycut in the United States between 2002-9, latency to onset 2 to 12 weeks [2 outliers at 1 and 2 years], hepatocellular pattern of injury, often severe, 4 were fatal or led to liver transplantation). Jóhannsson M, Ormarsdóttir S, Olafsson S. [Hepatotoxicity associated with the use of Herbalife]. Laeknabladid 2010; 96: 167-72. Icelandic. PubMed Citation (Five cases of Herbalife hepatotoxicity found in a survey in Iceland; 4 women, 1 man, ages 29 to 78 years, after 1 to 7 months of use, 4 with hepatocellular injury [bilirubin 1.5 to 18.2 mg/dL, ALT 456 to 2637 U/L, Alk P 149 to 712 U/L], all resolving upon stopping). liver failure: results of a U.S. multicenter, prospective study. Hepatology 2010; 52: 2065-76. PubMed Citation. (Among 1198 patients with acute liver failure enrolled in a U.S. prospective study between 1998 and 2007, 133 [11%] were attributed to drug induced liver injury of which 12 [9%] were due to herbals including usinic acid , thermoslim , ma huang , horny goat weed , black cohosh , hydroxycut  and unspecified herbals ). Molleston JP, Fontana RJ, Lopez MJ, Kleiner DE, Gu J, Chalasani N: Drug-induced Liver Injury Network. Characteristics of idiosyncratic drug-induced liver injury in children: results from the DILIN prospective study. J Pediatr Gastroenterol Nutr 2011; 53: 182-9. PubMed Citation. (Among 30 children with suspected drug-induced liver injury, only one case was attributed to an herbal; hydroxycut). Stickel F, Kessebohm K, Weimann R, Seitz HK. Review of liver injury associated with dietary supplements. Liver Int 2011; 31: 595-605. PubMed Citation. (Review of current understanding of liver injury from herbals and dietary supplements focusing upon herbalife and hydroxycut products, green tea, usnic acid, Noni juice, Chinese herbs, vitamin A and anabolic steroids). Slim-Fizz is a distinct appetite suppressant which contains the groundbreaking fibre Glucomannan, which is an organic dissolvable fibre extracted from fresh Konjac.